In Probing Popular Culture: On and Off the Internet, one of the leading authorities in American and popular culture studies presents an eye-opening examination of the Information Age’s influence on what we do, how we live, and who we are. Dr. Marshall Fishwick, author of the textbooks Great Awakenings: Popular Religion and Popular Culture; Popular Culture: Cavespace to Cyberspace; and Popular Culture in a New Age focuses his penetrating gaze upon the impact of the icons and events that color the fabric of our lives. Peppered with quotes from influential figures ranging from Plato to P. T. Barnum, this book provides food for thought that will spark smart discussion about every aspect of popular culturefrom Henry Ford to Y2K, the impact on popular culture of the September 11 tragedy, and more. Probing Popular Culture examines our cultural icons, our fads, our hopes, and our fears-and ties them into the images we see everyday in the news and on the Web. Dr. Fishwick probes the most recent developments, crises, and anxieties encountered on our headlong dash down the Information Superhighwayand illustrates the reasons behind the media madness. Religion, sports, food, comic books, TV, and movies-none escape his microscopic dissection. Who will arbitrate, regulate, and modify our flow of information? How much is too much? What is at stake? What lies ahead? 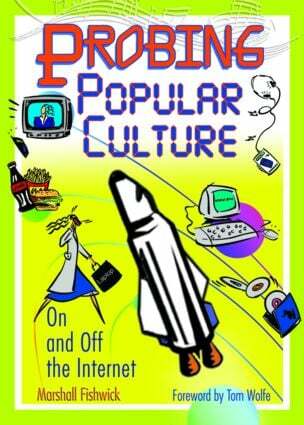 Probing Popular Culture takes an incisive look at the current situation and probes for answers. With a foreword by Dr. Fishwick’s former student, Tom Wolfe, a preface by Peter Rollins (Editor-in-Chief of Film & History: An Interdisciplinary Journal of Film and Television Studies), and the inclusion of opinions from other authorities on popular culture, this volume will be interesting and informative to the college student, the general reader, and the specialist. Epilogue: How Are We Different?